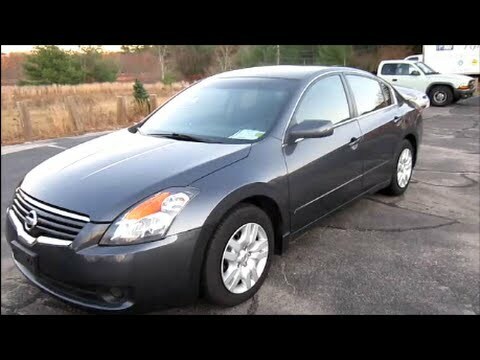 With two doors and a much sportier feel than the sedan, the 2009 Altima Coupe is a boldly-styled vehicle for those who want to get noticed. The reasonable price certainly doesn't hurt, either. The Nissan Altima is a perfect car for college aged students. This vehicle has given me little to no issues. I purchased it used about two years ago and have loved it ever since. It rives perfect and gets great gas mileage. One of my favorite things about the Altima is that it has a lot of extra space both inside the vehicle and in the trunk. It is perfect for a college aged student like myself. The only issue that I have had with it so far is that my catalytic converter needs replaced so my car now burns oil when it runs. I think that this is a common issue with my year of Altima, but I have not yet gotten it fixed. I have been experiencing this issue for the past six months but have just been checking and adding oil more than would normally be necessary. After having my Altima for 9 years I never really had problems with it until recently. 4 months ago I got my oil changed but it lead to needing more work done. I just replaced all 4 tire rotors. My power of steering hose has a leak in it but it will be replaced by this weekend. The motor mounts were burnt out on both sides and I already got them replaced. My spark plugs and wires have been changed. Once my power of steering is replaced I will buy new tires and replace my brakes. I really haven't been keeping it up so that is why everything had to be replaced all once. But now I will get it checked frequently because it is a great car and has never let me down in 9 years. Incredibly pleased with incredible price. My vehicle drives smoothly. The maintenance is never that expansive, and I have never had any major problems or repairs that were necessary aside from the usual maintenance, such as tires, rotations, and oil changes. I find this vehicle comfortable to drive for long vacations. The backseat and trunk are roomy. The sound system sounds great in the car, it is loud but has no rattling in the speakers ever. There are lots of great little gadgets that help me to save gas and keep track of how I am doing on mileage and reminds me when my car needs maintenance. It is a great car that I plan to drive until it just about falls apart. NISSAN WILL NOTIFY OWNERS AND DEALERS WILL REPLACE BOTH LEFT AND RIGHT SIDE FRONT STRUT INSULATORS FREE OF CHARGE. THE SAFETY RECALL IS EXPECTED TO BEGIN ON OR ABOUT OCTOBER 5, 2009. OWNERS MAY CONTACT NISSAN AT 1-615-725-1000. NISSAN IS RECALLING 225 MY 2009 ALTIMA VEHICLES FOR FAILING TO COMPLY WITH THE REQUIREMENTS OF FEDERAL MOTOR VEHICLE SAFETY STANDARD NO. 214, "SIDE IMPACT PROTECTION." THESE VEHICLES MAY HAVE BEEN MANUFACTURED WITH AN OUT-OF-SPECIFICATION WELD ON THE DOOR ASSEMBLY. NISSAN IS RECALLING 3,403 MY 2009 ALTIMA VEHICLES EQUIPPED WITH 16-INCH ALLOY WHEELS. SOME THESE WHEELS MAY NOT HAVE BEEN MANUFACTURED TO SPECIFICATION. THIS COULD CAUSE ONE OR MORE OF THE FIVE LUG NUTS ATTACHING THE WHEEL TO THE VEHICLE TO BECOME LOOSE.